Alice + Olivia fashion designer and owner Stacey Bendet Eisner kicked off New York fashion week with her Fall 09 fashion meets art presentation. The star studded event with guests such as Paris Hilton and Moby was held in the brand’s flagship store on Bryant Park South. 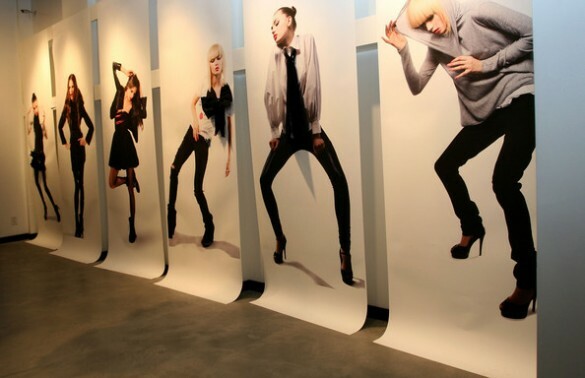 The show as uniquely model-less, opting rather for an art gallery feel, showing the collection in motion photography installments on bare walls. Guests packed the space to get a glass of champagne, gourmet mini cupcakes, and a glimpse at the beautiful artwork. The retail store turned gallery effectively showcased the collection’s big trends, pointing strongly to young, fierce, and edgy yet girly ensembles for fall. Black and pink combinations were a dominant theme, as were a mini collection of tee shirts with hip embellishment and sequins at the neck and shoulders. Other major elements included chains, zippers, and scarves, as well as Alice + Olivia for Payless shoes in funky skyscraper platform styles. Some fashion insiders and photographers say that the fashion as art, store as gallery thought will continue to gain momentum in both the traditional fashion and art worlds. 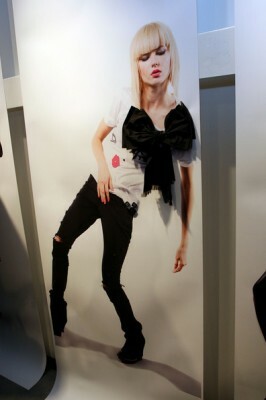 Check out the beautiful collection slash fine art installment below.